Be Sure to Plan to Attend! | ¡VidaMaz! Be Sure to Plan to Attend! This post is for all of you who complain that you only hear about things after the fact. Last year, one of the best trips we made was right here in Sinaloa: our visit to El Konti, the Lenten celebrations of the Mayo-Yoreme, which take place in northern Sinaloa and southern Sonora. I wrote extensively about this event last year. The Lenten Konti processions are a fascinating juxtaposition of native Mexican/pre-hispanic tradition, mixed with the Catholicism that came with the Spanish conquistadores. El Konti is a terrific example of a community rescuing its traditions, making conscious, concerted efforts to educate its youth and involve them in community life, rather than losing them to alcohol, drugs or petty crimes. Well, Ash Wednesday was this past week, the 18th; Easter is April 5th; and every Friday from today till March 27th, the Yoreme communities will be celebrating Konti. Then, on Holy Thursday, Good Friday, and Holy Saturday—the high days of Holy Week—there will be extra special activities to witness. Why don’t you check it out? I put some of my video footage together into an 11 minute movie, and I’d like to invite you to pour a cup of something, sit back, put it on full screen, and take a look. I find these people such great role models. Watch how they involve and educate their kids, rarely needing to correct them. Most of these kids are dancing for seven to eight hours straight—all day long, under the hot sun. They are wearing hand-carved wooden masks, heavy carrilleras or bamboo skirt-like percussion instruments, and tenabaris or pebble-stuffed butterfly cocoons wrapped around their legs. 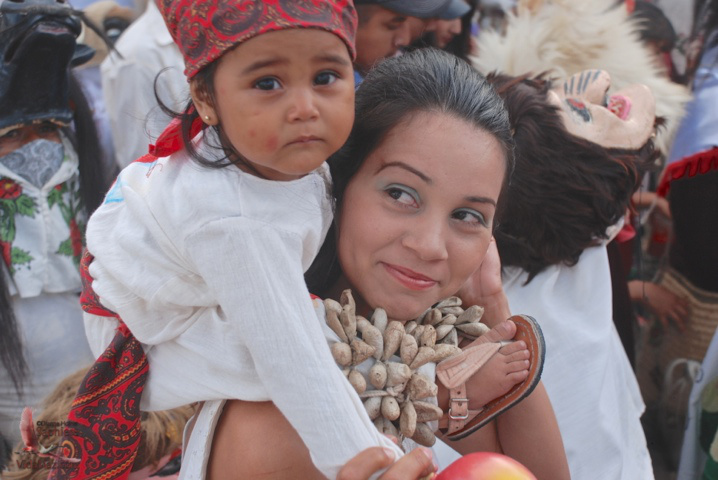 They wear handprinted or embroidered white manta clothing and cape, and simple huaraches on their feet. Some boys may not have all these things, and may have to improvise: I saw several tenabaris made out of recycled soda cans, for example, and some kids wearing jeans. 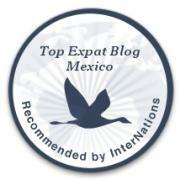 San Miguel Zapotitlán is just a four-hour drive north of Mazatlán, 15 km north of Los Mochis on highway 15. It has a large procession bringing together 30 Yoreme communities in the municipality of Ahome. Mochicahui, which we visited, is located at km. 15 on the highway between Los Mochis and El Fuerte. We spent the night there, at a hotel we found right on the highway: the Hotel Doux. If you’re planning a more extensive trip, you will be right at the starting point of El Chepe train, the transportation through the Copper Canyon. That was the first trip we took once we moved to Mexico, and one I very much want to repeat! Chore´utesia (muchas gracias) por hacer un aporte mas de nuestra cultura Yoreme Mayo de Sinaloa, reciban un fuerte abrazo y espero que vuelvan nuevamente a visitarnos. Para que sean unos portadores mas de nuestros usos y costumbres. Tienen todo mi respeto por la manera en que están guardando y promulgando la cultura Yoreme y sus tradiciones, Celia. Es otro orgullo mexicano, y un ejemplo para todo el mundo. Mis felicidades!